Your cultural itinerary includes sights like Museu Calouste Gulbenkian and Jeronimos Monastery. Head to Avenida da Liberdade and Rossio Squarefor plenty of shopping. Take a break from Lisbon with a short trip to Quinta da Regaleira in Sintra, about 36 minutes away. Next up on the itinerary: wander the streets of Belém Tower, explore the historical opulence of Castelo de S. Jorge, stop by A Outra Face da Lua, and admire nature's wide array of creatures at Lisbon Oceanarium. To find where to stay, more things to do, reviews, and more tourist information, refer to the Lisbon online trip itinerary planner . Belem, Brazil to Lisbon is an approximately 10.5-hour flight. Due to the time zone difference, you'll lose 3 hours traveling from Belem to Lisbon. Expect slightly colder temperatures when traveling from Belem in June; daily highs in Lisbon reach 32°C and lows reach 18°C. Finish up your sightseeing early on the 6th (Sat) so you can go by car to Portimao. On the 7th (Sun), tour the pleasant surroundings at Barranco das Canas Beach, then kick back and relax at Molhe Beach, and then enjoy the sand and surf at Praia Da Rocha. Keep things going the next day: look for gifts at Teddy Mountain, then enjoy the sand and surf at Praia do Canavial, and then explore the striking landscape at Ponta da Piedade. For maps, traveler tips, more things to do, and more tourist information, read our Portimao tour planner. You can drive from Lisbon to Portimao in 3 hours. Alternatively, you can take a bus; or take a train. 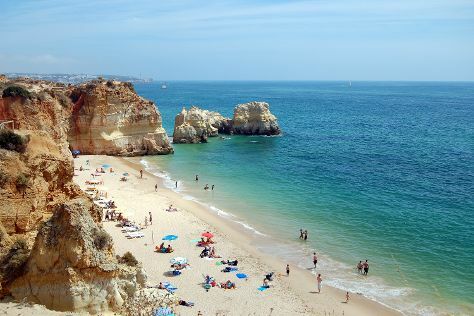 June in Portimao sees daily highs of 32°C and lows of 21°C at night. Cap off your sightseeing on the 8th (Mon) early enough to go by car to Seville. 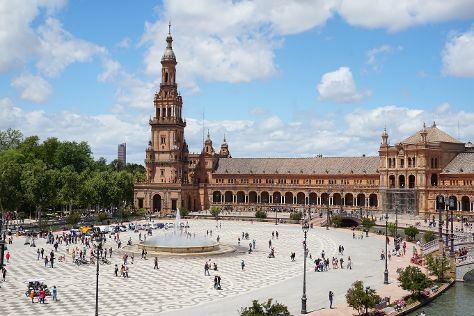 Kick off your visit on the 9th (Tue): steep yourself in history at Plaza de España, catch a live event at Plaza de Toros de la Maestranza, and then explore the world behind art at Museum of Fine Arts, Sevilla. On the 10th (Wed), you'll have a packed day of sightseeing: take in nature's colorful creations at Royal Alcázar of Seville, then wander the streets of Barrio Santa Cruz, and then get great views at Catedral de Sevilla. You can plan Seville trip in no time by asking Inspirock to help create your itinerary. Drive from Portimao to Seville in 2.5 hours. Alternatively, you can take a bus; or do a combination of bus and train. The time zone changes from Western European Time to Central European Time, which is usually a 1 hour difference. In June, plan for daily highs up to 35°C, and evening lows to 20°C. Finish your sightseeing early on the 10th (Wed) to allow enough time to drive to Ronda. Shop till you drop at Bodegas Cortijo Morosanto and Scott Simpson Fine Art. Step out of the city life by going to El Tajo de Ronda and Reservatauro Ronda. Step out of Ronda with an excursion to Playa Ronda Paco in Fuengirola--about 1h 20 min away. There's much more to do: do a tasting at Bodega Garcia Hidalgo, snap pictures at Puente Nuevo, make a trip to Ronda, and contemplate the long history of Ermita Rupestre de la Virgen de la Cabeza. To see more things to do, traveler tips, and other tourist information, read our Ronda road trip planner . You can drive from Seville to Ronda in 2 hours. Other options are to take a bus; or take a train. In June, daily temperatures in Ronda can reach 37°C, while at night they dip to 19°C. Finish your sightseeing early on the 13th (Sat) to allow enough time to drive to Nerja. Nerja is a municipality on the Costa del Sol in the province of Málaga in the autonomous community of Andalusia in southern Spain. You'll enjoy a bit of beach vacationing at Playa El Salon and Playa del Molino de Papel. Take a break from the city and head to Playa de la Alberquilla and Playa de la Cala el Canuelo. There's lots more to do: enjoy the sand and surf at Playa Torrecilla, stroll through Playa El Playazo, don't miss a visit to Balcon de Europa, and explore the fascinating underground world of Fundación Cueva de Nerja. To see reviews, more things to do, maps, and tourist information, use the Nerja visit planning tool . Drive from Ronda to Nerja in 2.5 hours. Alternatively, you can take a bus; or do a combination of train and bus. Traveling from Ronda in June, you will find days in Nerja are a bit cooler (33°C), and nights are about the same (17°C). Cap off your sightseeing on the 17th (Wed) early enough to travel to Madrid. Prado National Museum and Royal Palace of Madrid are good opportunities to explore the local culture. For shopping fun, head to Mercado San Miguel or Gran Via. Venture out of the city with trips to Toledo (Church of Santo Tomé & Catedral Primada). There's still lots to do: stroll around Retiro Park, explore the world behind art at Museo Nacional Centro de Arte Reina Sofia, shop like a local with Rio Creative Art Center, and admire the striking features of Plaza Mayor. You can do a combination of bus and train from Nerja to Madrid in 5 hours. Other options are to do a combination of bus and flight; or drive. In June, daily temperatures in Madrid can reach 36°C, while at night they dip to 19°C. Wrap up your sightseeing on the 20th (Sat) early enough to take a train to Barcelona. Do your shopping at La Boqueria and Passeig de Gracia. Satisfy your inner culture vulture at El Barri Gòtic and Basilica of the Sagrada Familia. There's much more to do: explore the galleries of Casa Batllo, shop like a local with Opera Lounge, tour the pleasant surroundings at Barceloneta Beach, and stroll around Parc Guell. For more things to do, ratings, traveler tips, and other tourist information, you can read our Barcelona itinerary planning tool . Traveling by train from Madrid to Barcelona takes 3 hours. Alternatively, you can fly; or drive. Traveling from Madrid in June, expect nights in Barcelona to be about the same, around 22°C, while days are a bit cooler, around 30°C. Wrap up your sightseeing by early afternoon on the 23rd (Tue) to allow time for travel back home.